Farmgirl Fare: Monday Dose of Cute: Come and Get It! © 2010 FarmgirlFare.com, the daring foodie farm blog where I knew going into it that farming was a dangerous business, but I never imagined that one day I would risk being run over by a herd of adorable, treat crazed donkeys because I was too slow to put down the camera and give up the bucket—and that last photo of Daphne wasn't taken using the zoom. FUNNY!!! I actually did laugh out loud at that sequence of pictures! *smile* I love them. The little ones are growing, aren't they? There is something so cute/funny/enchanting about donkeys. Thank you for sharing your treat crazed crew with us! I found you on Kalyn's blog. Loved your chocolate/garlic comment and had to come check you out. SO glad I did. 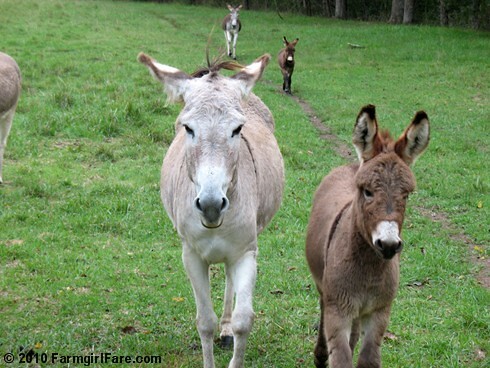 I love your blog and that donkey serious of photos is total cute overload! And great "about" story as well. While I'm no farm girl, I love my CSA farm share and appreciate the hard work you all do. Farmers are definitely the new rock stars. You go farmgirl! Peace, love and a big dose of cute! Susan, you just don't know HOW much I look forward to your pictures! I live here in beautiful Missouri with you, and we moved here from California some years ago also. I have written you before, I am in LOVE with your donkeys, I look EVERY DAY for the donkey pics, trying to talk my hubby into getting us some of these guys...I have adored them ever since Donkey Doodle Dandy! If I ever get one, I am stealing his name...ROFL! I was hoping that there was a fence between you and those poor starving donkeys. Oh well. I just hope you were able to save the camera from being eaten! Wow! Nothing quite like a determined donkey on a mission, huh? Great photos (hope no one was hurt!) - thanks so much for sharing these photos (and everything else) with the rest of us! Love it!! The last one especially makes me laugh! Like Zona, I too was sitting here laughing out loud. I so love your blog and all your many critters. I'm with Linda....you don't know how much I look forward to seeing what you have posted about the animals. The pictures make me both laugh and cry. And I've been guilty of wondering just how big is my back yard and wonder if a donkey would fit and what would the puppers do with a pet donkey!!! 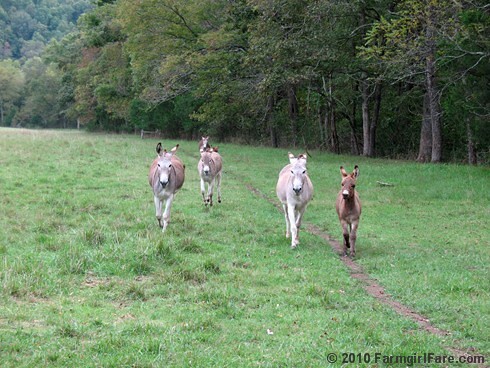 Great progression of the threatening donky herd! 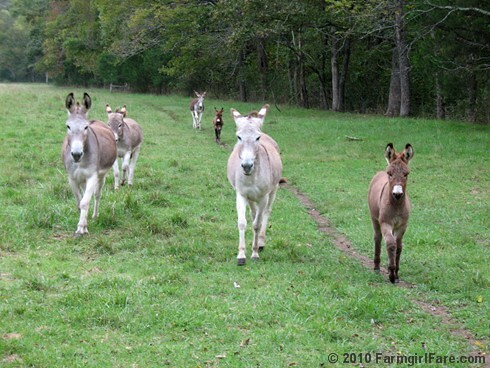 The donkey's are looking like they are enjoying fall! Mine are enjoying cooler weather this week. 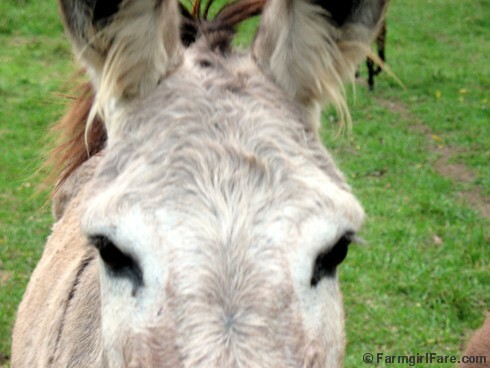 Those donkeys have the cutest furry ears! R U OK? So cute, I just love Gus and Gnat's thick baby face fuzz -- looks like they'll get a little more sleek as they grow up. And obviously they have you well trained!